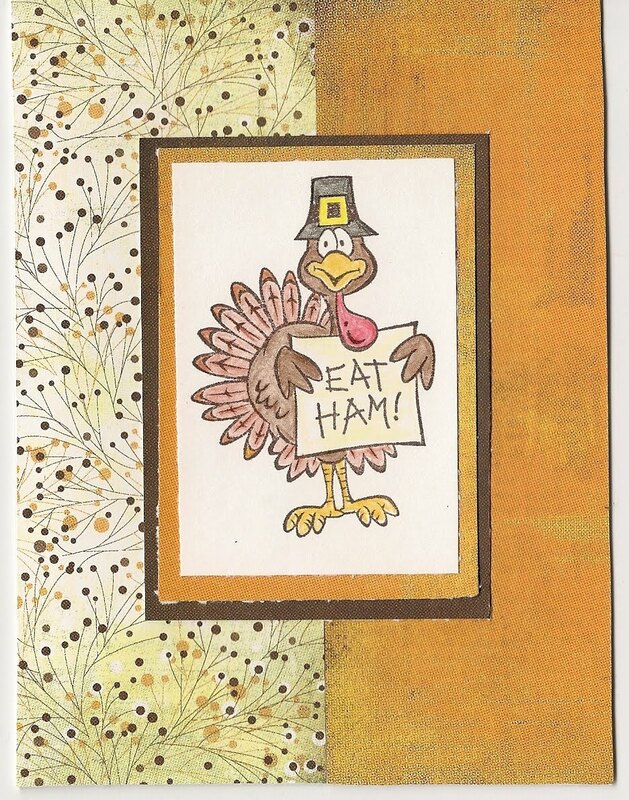 This week's wacky wednesday challenge at More Then Favors is anything Thanksgiving/Fall theme. 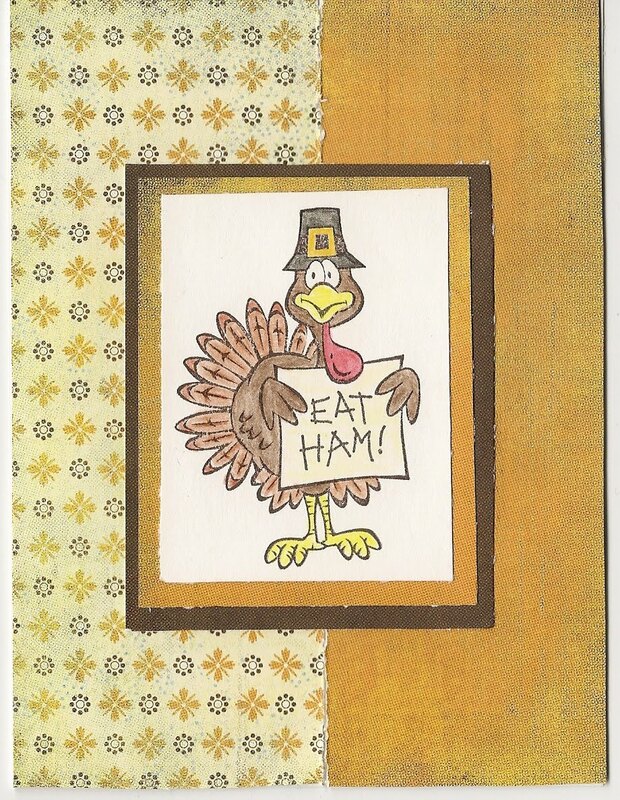 I made these two thanksgiving cards. 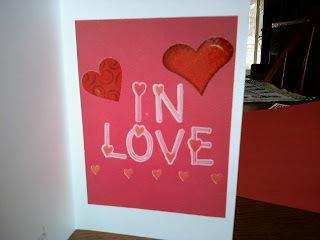 Love this stamp it's made by Inkadinkadoo and all the paper used is from 6x6 basic grey Mellow paper pad. The deadline for the challenge is Deadline for this Challenge is 11:59pm PST Monday November 22nd there's still time for you to play. 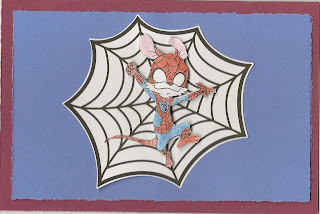 This cute little spiderman is a free digital image that can be gotten at Whiff of Joy Blog . 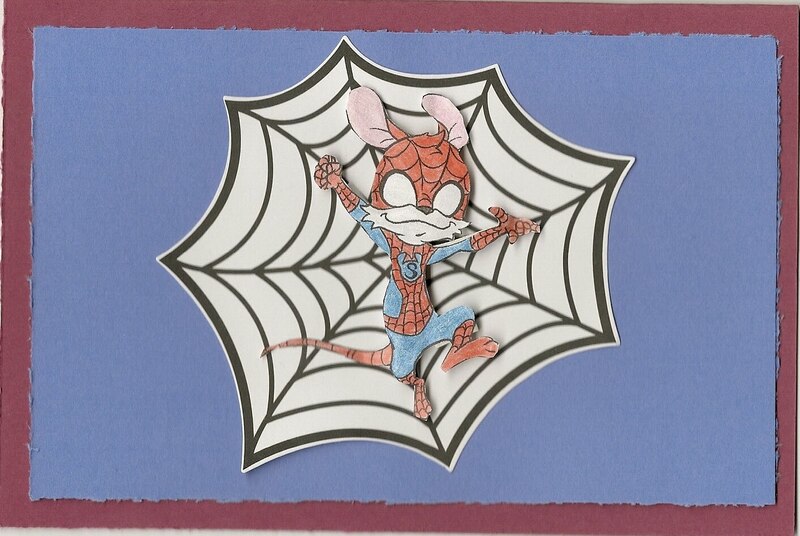 The spider web is from K&CO cardstock diecut set. I think I am going to make another card using this little cutie. I made the candy corn using the cricut George cartridge. 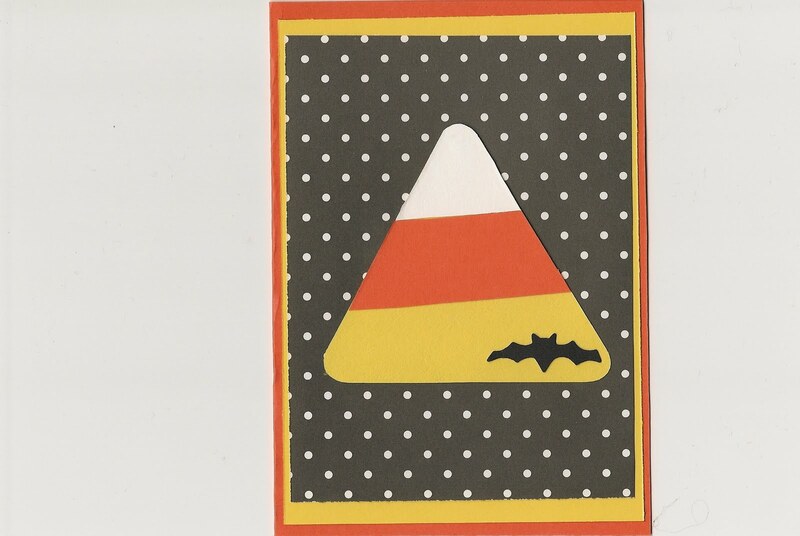 candy corn is my fave halloween candy. Used to get so mad when I was little my uncle percy used to come over when I was sleeping and eat my candy corn I would be so mad the next morning. He did it just to aggervate me. Used to tell my parents to hide my candy corn from him. Good times. 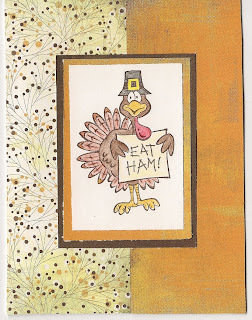 I have missed all my blogging friends. Hope everyone is well. Tonight I decided to pull the crafts and make several halloween cards. 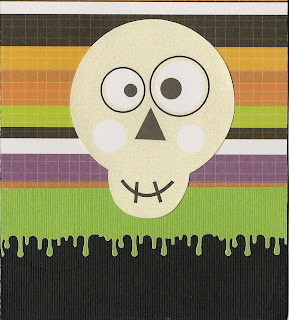 This card uses K&Co Spook Tacular pattern paper, K&CO Cardstock diecut, and martha stewart drippy doo punch (received the punches from a swap awhile back), and plain black cardstock. It's hard to tell in the picture put the skeleton is glittered. 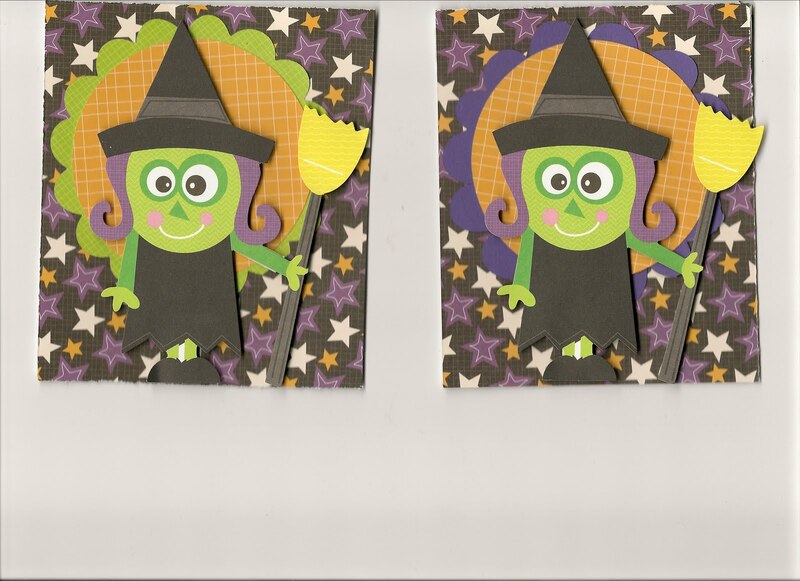 For the next two cards I couldn't decide if I liked the green or purple scallop so I made both :) All paper is from K&CO spook*tacular paper pack and the cute little witch is from K&CO cardstock diecut set. 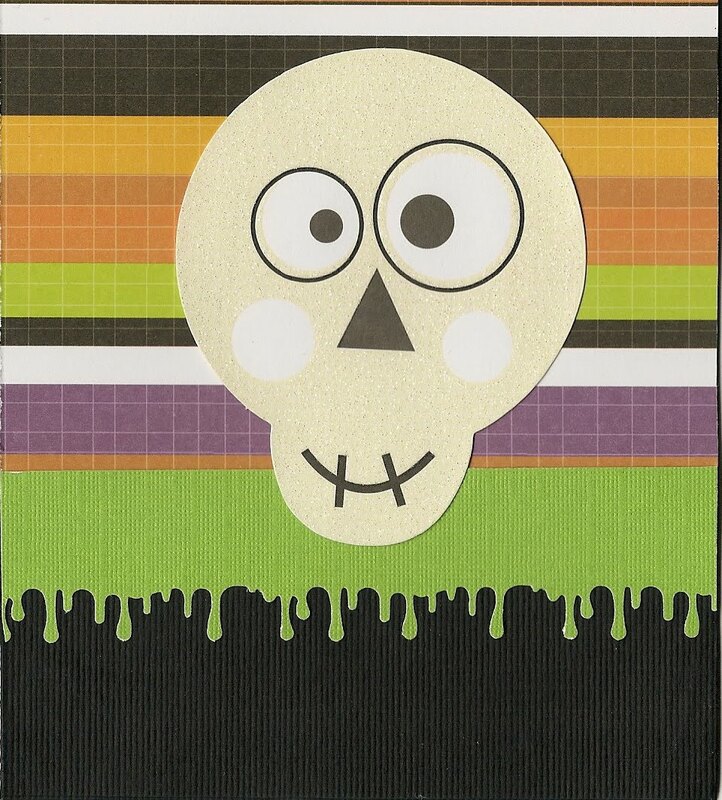 K&Co is my fave scrapbooking company. Finally I am able to log into blogger. What a mess that was! 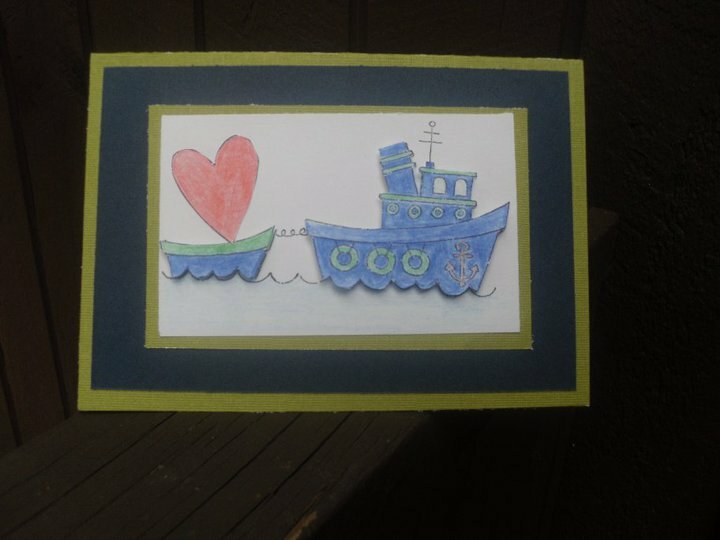 This card using the "Boat Loads of Love" SU set. I love the colors of this. 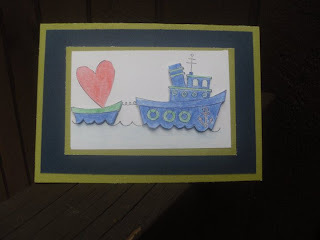 It's hard to tell from the pic but the boat and heart are pop dotted. I made him this card in honor of 9/11. 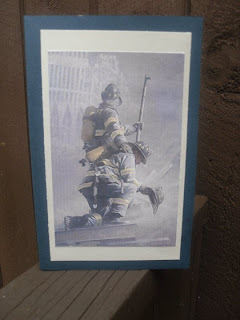 Cause on 9/11 . The image I got off line. 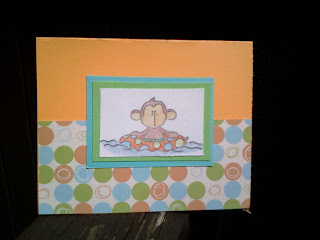 This is another card using the SU Cheers Stamp set. 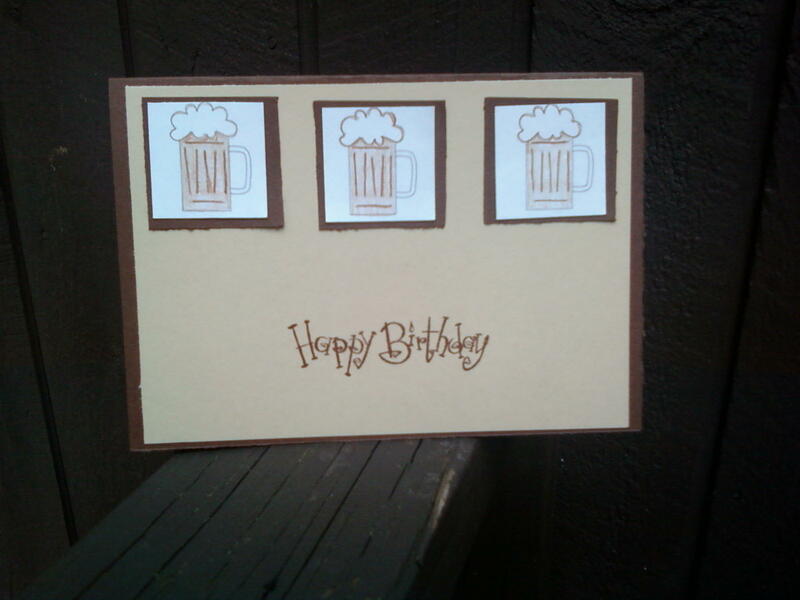 I always have a problem coming up with male birthday cards. Female cards are so easy you can do all the bling and frills. LOL! Thanks for looking. 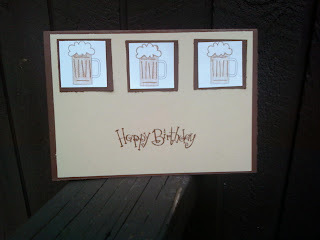 I will have another birthday card to share in a few days. 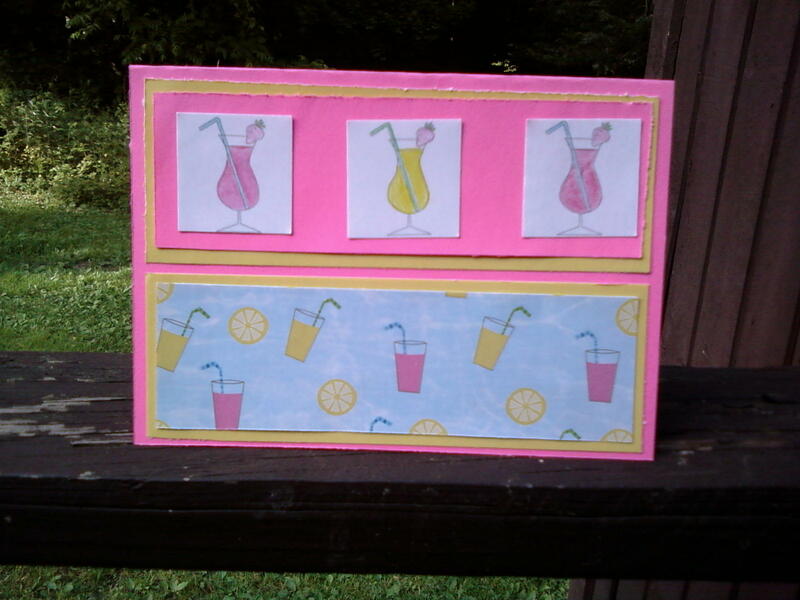 The first two cards use the SU Cheers Stamp set. 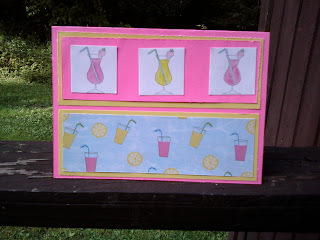 All pattern paper is from DCWV 2009 Summer paper pack. The last card is a stamp from CC Designs Summer Fun stamp set. Love that little Monkey. 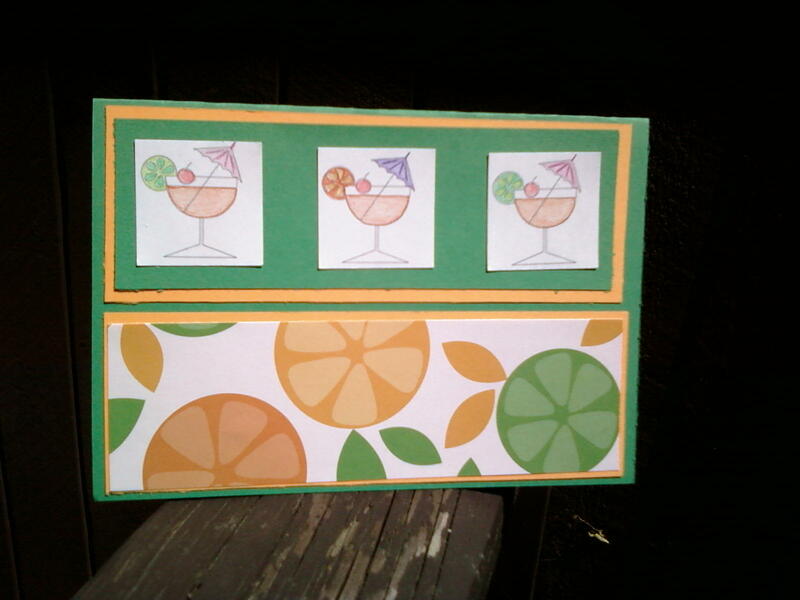 So glad to be back into crafting again. I made this for fun. I got the idea from PaperCrafts January Issue (with my own twist of course). I got a deck of cards at the dollar store and everything else came from my stash. 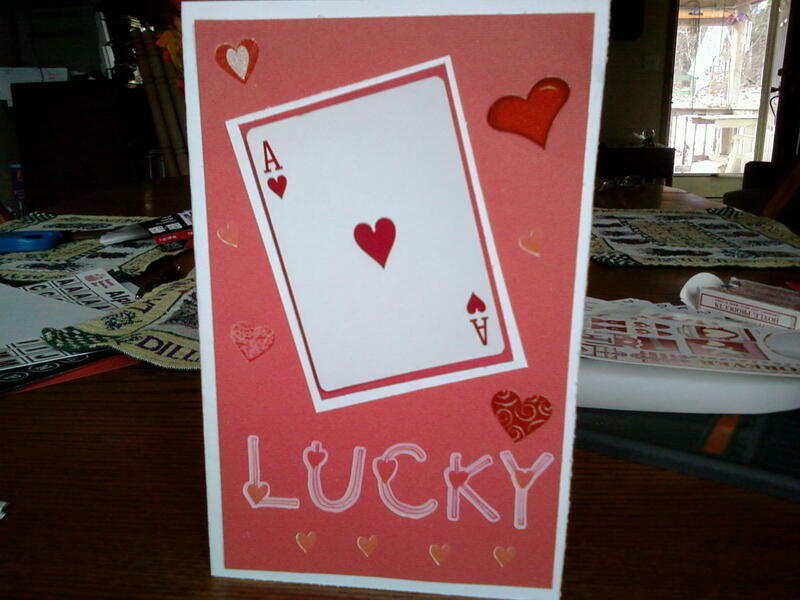 The word "Lucky" is stickers that I got at the dollar store when they had a nice assortment of scrapbooking items. And the hearts are rubons. I think it's cute. 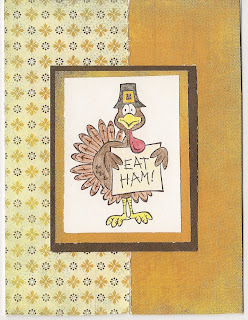 I have missed all my blogging friends. I hope to get back into the swing of things again. Life is slowly getting back to normal. 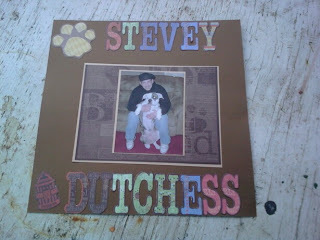 Made these pages for my friend Stevey, just wanted to get back into scrapbooking again. 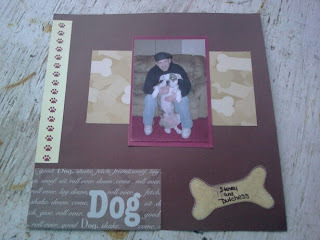 For these two pages I used the DCWV Dog Paper Kit purchased at Michaels. Cute kit but wasn't worth the money. The first layout is my fave out of the two of them.